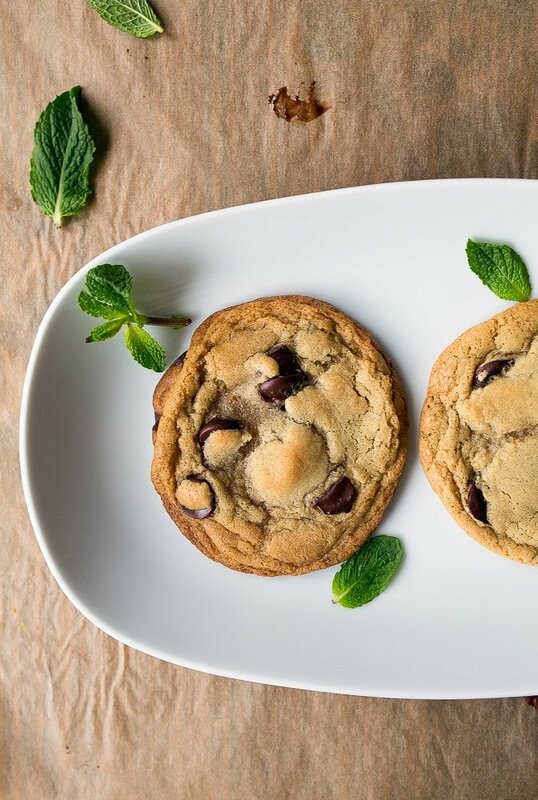 Mint chocolate chip cookies from Dishing Up The Dirt’s new cookbook. Butter infused with fresh mint! I should clarify: REAL mint chocolate chip cookies. 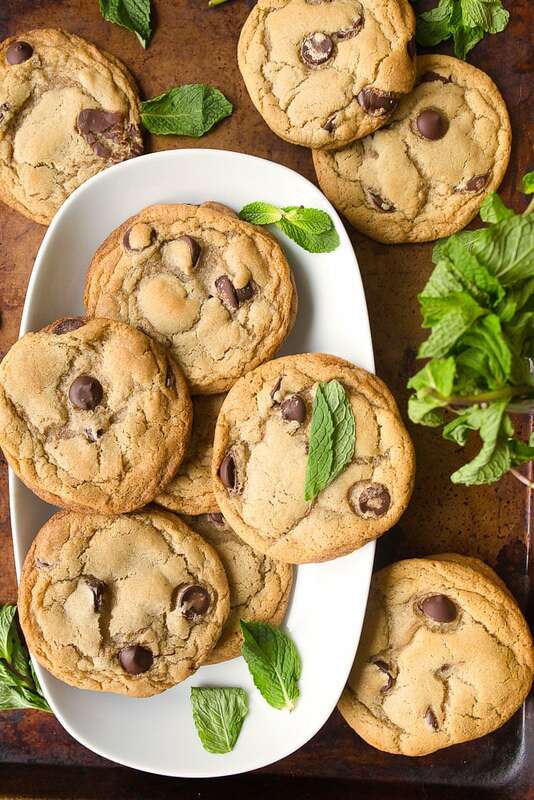 Chocolate chip cookies made with fresh mint that you clipped from your garden and steeped in melted butter. Oh, this just got really good, didn’t it? This is shaping up to be a very good year! So many new cookbooks have landed in my hands, and I’m so inspired by all of them lately. My friends in the food world have been hustling hard lately, and I’m so dang proud of them. 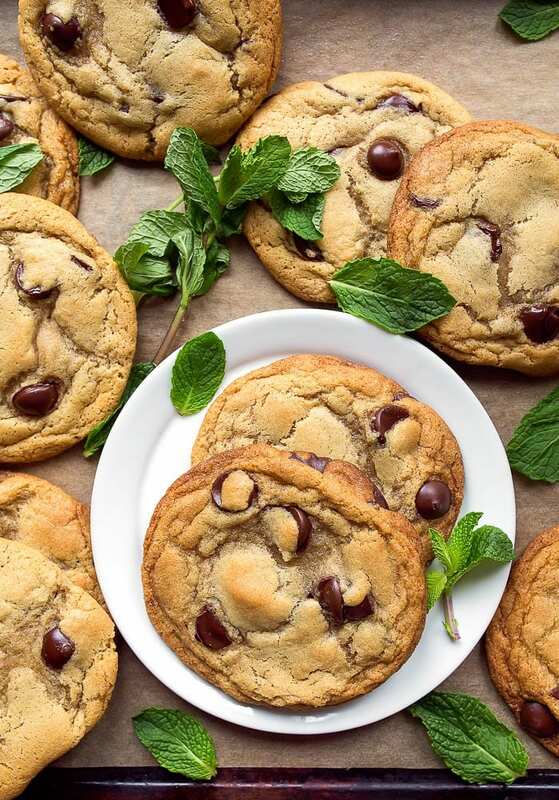 The recipe for these mint chocolate chip cookies comes from the lovely Andrea Bemis’ new cookbook, Dishing Up the Dirt! If you don’t know Andrea, let me catch you up real quick: she’s an adorable farmer chick that writes incredible recipes using the ingredients fresh from her fields that she tends with her husband and dog. And the girl can photograph her recipes like a boss and write an incredible cookbook! She’s a gem, you guys. I’ve been reading her blog for 4+ years (you guys know I used to work in farming, right? ), and I love her real-life approach to farm-to-table food. It makes me miss driving tractors! Her gorgeous cookbook is mostly vegetarian and plant-based, but I considered it my duty to showcase one of her fabulous desserts. I can just imagine Andrea trekking out to her bountiful mint patch in her muddy work boots with her farm dog trotting alongside her. The sun is starting to set, and she’s wrapping up another long day of hard work on the farm. She clips a handful of fresh mint, and starts the long walk back to the house, reflecting on what she will make for dinner that night. It was slightly less romantic when I climbed over my fence and yanked up the last of the scraggly mint that escaped from one of my pots, sniffed it to make sure my dogs didn’t pee on it, and then ran back inside before my Tom’s got too dirty. Andrea and I basically have the same life, you know. In my dreams! Mint chocolate chip cookies are my new obsession. All jokes aside, I have serious respect for Andrea, and it’s not just because when I met my husband, we tended a 1/2 acre garden behind my house and had dreams of running our own farm some day. Somewhere along the lines, we’ve lost our way and I traded my vast garden for a few herb pots on a concrete patio. I’ve got to remedy this. And it’s perfect timing, because I want to teach Camille how to grow her own food, too. But at the very least, I’m teaching her to love chocolate chip cookies. These cookies, upon first bite, taste like incredible chewy chocolate chip cookies. It takes a few seconds for the cool mint sneak up on you. I don’t know if I’ll ever be able to make regular chocolate chip cookies again–these are so good! And Andrea has me dreaming of soaking all kinds of herbs in butter and baking with it. You inspire me, girl. Congrats on the book, babe! It’s a beauty! Check out Andrea’s book here. If you’re looking for small batch chocolate chip cookies without mint, I have that, too. 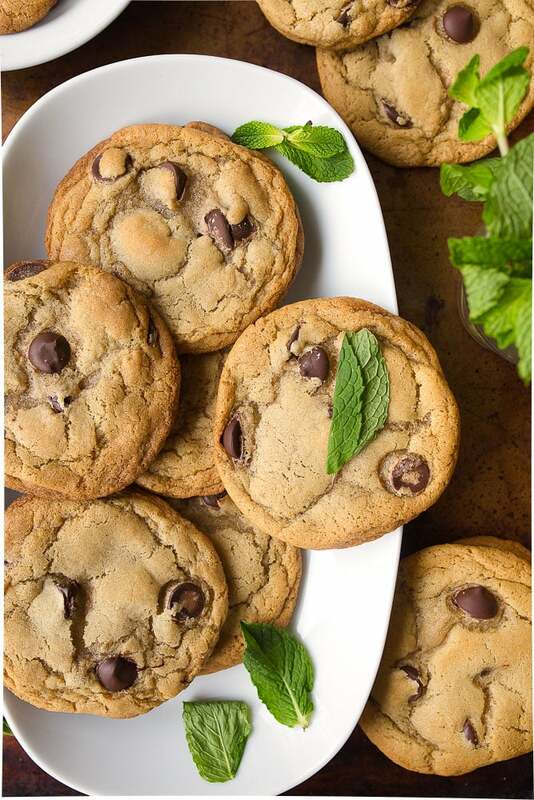 Chocolate chip cookies made with real fresh mint! Haha, I feel like our garden situation is similar – we have a small raised garden in our little patio area. Which is great considering we live in a condo, but the dogs sometimes like to play “farmer” and water the garden for us. Gross. I <3 you for bring these cookies and this new Blog into my life! Love ALL of your recipes, and ready to fall in love with hers too! Yum! Nothing better than fresh mint, unless it’s fresh mint in chocolate chip cookies!! 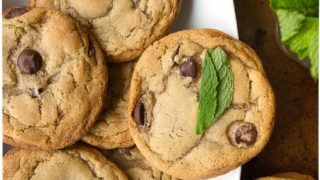 Could you just encorporate the mint leaves and butter mixture right into making the cookie dough? I don’t recommend that. The leaves might brown or burn in the oven. 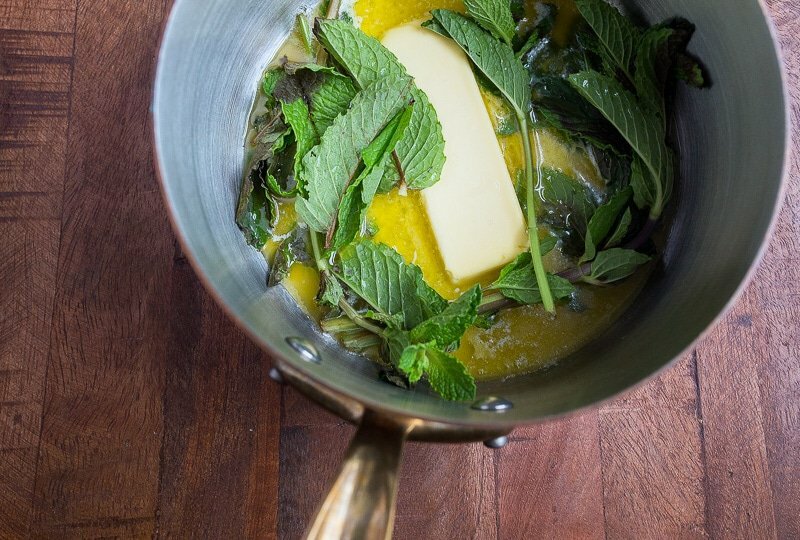 I promise you’ll have the mint flavor from infuses the butter with the leaves. hey girl- these cookies look amazing! Y’all have a great weekend! Ohhh I LOVE this idea–how subtle the mint is (and that it’s legit actual mint leaves). Definitely need to try! These came out fantastic at a high altitude too. Thank you for the recipe! I made your recipe but my cookies came out SUPER flat! Are you sure you meant to write “baking soda”? I think baking powder would be better in this recipe. I like the idea, though! Awww, Cat! I’m so sorry! I definitely meant baking soda, because I used the recipe from Andrea’s book. Hmm. I’m wondering if the butter temperature was the culprit…was it warm? Was your cookie sheet warm when you added the raw dough? Is your oven running hot? Hi. This recipe sounds delish! Wondering if the infused butter can be made in batches (enough for 1 recipe) and frozen for future use? Have a bounty of mint, looking for different ways to keep for year round use. Ohh, good question, Donna! I think so. I don’t see any reason why you can’t freeze the flavored butter, but wrap it very tightly in several layers to keep it fresh. Maybe try to use it within 3 months? I actually made these into bars and it worked out really well. I followed the instructions exactly and the only thing I did differently was put the chilled dough into a 9×13 pan and bake it at 325F for 30 minutes. So good! Could I replace the butter with vegetable oil or coconut oil? I only have 1/4 cup left of butter and still want to make 12 cookies! Oh, I don’t think so, Michelle. Butter and oil behave very differently in cookie baking. In other recipes, like cakes, it’s probably okay, but oil makes cookies spread way too much during baking. I haven’t tried it. My husband says we have spearmint in the backyard and I should use peppermint. What do you suppose will happen if I use the spearmint? I had to add almost an entire cup of butter extra on top of the butter from the recipe because the dough wasn’t binding. It was very crumbly, even if I tried clumping it into a ball. That sounds insane. Did you follow the instructions correctly? This recipe comes from a cookbook that was very well-tested and made it through several rounds of recipe testing. Were you working with melted butter, like the recipe states? And how did the cookies turn out, since you added an extra 2 sticks of butter? So curious how those cookies turned out, because I had the same issue! My dough didn’t really come together…had to shove the dough into balls to put them on a cookie sheet. They taste awesome but look awfully silly :) I’m wondering if I just lost too much butter in the mint straining process. Love these cookies, I made them yesterday with spearmint as it’s the only fresh mint readily available to buy where I live. As you suspected, it comes out a little toothpaste like and while the flavour isn’t bad, I’d like the peppermint hit. I have peppermint essence, could I infuse the butter with that instead? Would a teaspoon of essence be enough, I wouldn’t want to overpower the cookie. So glad you liked the cookies, even though they had a hint of toothpaste flavor! I think you could definitely stir in a 1/2 teaspoon of peppermint extract and have great cookies! Stir it into the wet ingredients. Enjoy! I have made these twice now and both times my cookies do not spread! What am I doing wrong? The dough seems very dry, and like a previous commenter, is crumbly… do I need more butter? Egg? The cookie balls are super tasty, but I’d like to make a real cookie at some point… lol. I’m so stumped on this! Half of the people say this recipe is amazing, and the other half says it doesn’t work. The recipe comes from a very well-tested cookbook, and it worked perfectly for me 3 times. I’m wondering if your eggs are too small? Which size eggs are you using? Are you following the directions exactly? Melting the butter and letting it cool? Do you think I could substitute almond or coconut flour? I’m sorry, I haven’t tried them that way. Do you have the cup4cup gluten-free baking mix? That might work. I know coconut flour won’t work because it absorbs too much liquid. Hello! I’m trying to see if I could make this vegan and was wondering if you have any suggestions for how to still incorporate the fresh mint flavor possibly with another medium instead of dairy based butter? I have made these cookies twice in the last month. They are amazing! This is becoming a new family favorite. Thank you for sharing it! I love finding new ways to use my mint patch. Now, I have something to do with my chocolate mint (lovely chocolately mint flavor; I usually just pick a leaf and eat it). Can I use substitute regular table salt for fine sea salt, or will it change the flavor of the cookies? hi, i tried this recipe, and it turned out great, is there any way i can make it eggless? I’m a newbie to cookie making and I could not go past this recipe, the pregnancy cravings were going mad after drooling over this one! I took a leap and incorporated my mint leaves into the the dough, after the 30 minute steep after a bit of research on google I did find others had succeeded without any issues for a more intense flavour mine have turned out beautiful! As for others saying the mixture was too dry, depending on the temp of your house etc I heated my butter up again after the 30 minutes so it would bind as I was worried my butter had cooled too much. I had the same issue as some others- very crumbly batter. It was the texture of sand, both before and after refridgeration. I don’t have enough mint to experiment on my theory right now with a second batch. Next time and I’ll post an update. As for this batch, when I pulled it out of the fridge to check if it had bounded together, I decided to add more butter because it was still looking like sand. I added almost a full stick (2 tbsp shy of it) of very hot, melted butter and that did the trick to get it to resemble a dough. I then put it back in the fridge to cool again. I was a bit worried that with that much butter they would spread too much when they baked, since the recipe already warns you that they’ll spread. So I kept adding the melted butter, 1 tablespoon at a time until I got it to bind. I didn’t want to use any more butter than was necessary. Just a handy tip- to get 12 equal sized balls of dough, use a 1/4c measuring cup and pack it in, then take it out to form the ball. Also, at 11 minutes, they werent even close to done. Typically when I cook 1/4c sized cookies (which is the perfect size, btw), they need to cook for 16-18m. PERFECT! The extra butter didn’t cause them to spread that much. The cookie were crunchy on the crust and chewy in the middle. So, next time I make these, I’ve modified the recipe give myself notes! Meanwhile, line two baking sheets with parchment paper, and set aside. Put sugars in the stand mixer bowl. In a separate bowl, whisk together the flour, baking soda and salt. After 30 mins, strain the butter, pressing the leaves to extract all of the butter from the leaves, as best you can. Microwave the butter for 5 seconds to get it hot again. In the bowl of a stand mixer, add the butter to the sugars. Beat until light and creamy, 3-5 minutes. Slowly add the prepared dry ingredients to the mixer while running, stopping to scrape the bowl as necessary. Use a 1/4 measuring cup, packed to achieve 12 uniform amounts of dough. Roll into balls and space 6 balls on each cookie sheet (the cookies will spread a bit). Bake for 16-18 minutes, rotating the pans half-way through.